Registration is open for this year’s IJA Festival! Not only that, but our festival pages have been updated with a slew of information about this year’s festivities. Stop on over to the Festival section of our website to read all about the special guests, shows, competitions, and more. Don’t think that this is the final update, however. We still have several more special guests in the works, and Festival Director Noel Yee and his team have a few other surprises in store, so stay tuned! Don’t forget that IJA member have access to exclusive video content on eJuggle. This includes the recently released 2017 Festival video. Relive the memories of last year’s festival and get hyped for this year’s event! It’s time to think about running for the IJA Board of Directors, or about nominating someone you think would be good for the IJA. The Board is a key part of the IJA as it sets the directions we’ll be heading. Four seats on the Board are up for election this year. Read what Board members do and how to make nominations. IJA festival registration is open, but Advanced registration prices end soon, at 11:59pm ET on March 5, so don’t delay registering if you want the Advanced rate. Fest pre-registration is only available online. We have two IJA hotels at the festival: the Sheraton and the Tower Square Hotel. Both are very close to the festival venues. IJA rooms at the Sheraton are sold out (unless they get a cancellation), but as of early March there are plenty of rooms at the Tower Square Hotel. If you haven’t made your hotel reservation, now is a good time to do so. There is currently no web page for reserving Tower Square rooms at the IJA rate, but you can call 1-844-656-8641 and ask for the IJA rate (or the jugglers’ rate). If you have trouble getting a reservation at the $99 IJA rate, please let us know. NOTE: The Tower Square Hotel is no longer a Marriott hotel, but IJA room reservations made before their name change are still valid. You can now enter the 2018 IJA Stage Championships. The Championships rules and info on entering are available in English and Japanese, with many parts translated into Spanish, Russian and Chinese. If you want to help us translate the remaining parts into one of those last three languages (or if you see any issues with the translations), please contact Martin Frost at IJAcommunications@juggle.org. The deadline for entering the Stage Championships is May 15, 2018. Entrants need to submit an online application form, entry fee and video by that date. For more information, start with the Applying to Compete section of the rules. If you haven’t taken our member survey, please take 10 minutes to fill it out. Your opinions will help us a lot. To take the survey, log in at: https://ym.juggle.org/login.aspx and then go to: https://ym.juggle.org/surveys/?id=member_services_survey. If you have any problems reaching the survey, please contact us via the form at https://www.juggle.org/contact/. We greatly appreciate your taking the survey by March 18. Thanks! The 2019 IJA festival will be held in Fort Wayne, Indiana, June 24-30, 2019. The IJA would like to hear from individuals who are interested in taking on the role of Festival Director. The Festival Director works with the venue and the IJA staff and volunteers to create a fabulous week of juggling. Volunteers help with most aspects of running the festival. Previous festival directors are available to mentor you through the process. Some aspects of the festival repeat consistently from year to year, such as the competitions and shows. There is always room to try new things and put your personal stamp on the experience. If you are interested in the position or just want to learn more about the job, please contact IJA Chair Nathan Wakefield. 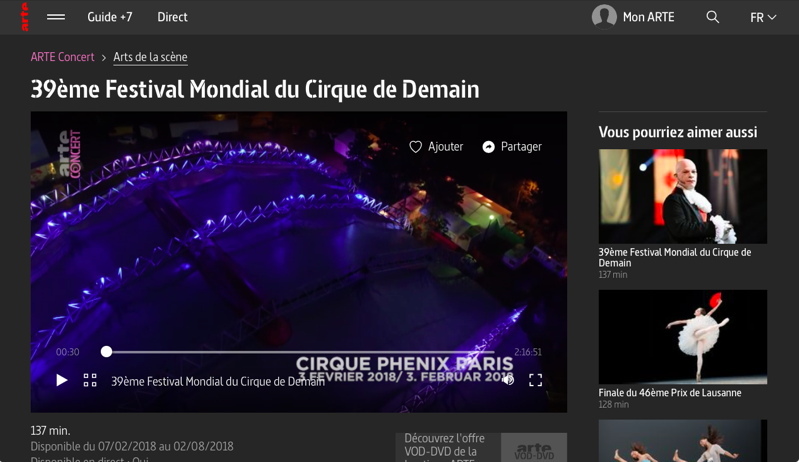 The Cirque du Demain competition in Paris attracts great new acts from all over the world. You can see the best parts of the show on the Internet at the ARTE.tv website. The show is available for a limited time. There’s some great juggling to see. You can also download the ARTE app and watch it on a tablet. Note that the website is available in several languages, but not all shows appear in all languages. I found this video on the French language site. The dialog by the show’s distinctive host is all in French, but the individual acts are not language based. Two hundred and thirty-four registered jugglers and 10 vendors attended the 40th annual Groundhog Day Jugglers Festival held at the Yaarab Shrine Center in downtown Atlanta on Feb 1-3, 2018. Atlanta Jugglers Association founders Rodger French and Toni Shifalo both made the scene, as did a number of other prominent members from the 1980s, including Jeff Mather and Cirque du Soleil star Kenny Raskin. Vendors this year included Ninja Pyrate, Kendama USA and Cathedral Juggling, following their mad plan to conquer the world of juggling rings. Brandon Ross and friends provided some arresting face paintings ranging from subtle highlights to full-face makeovers. Friday afternoon started quietly. Jay Ko, our official videographer from Philadelphia, set his fortress of technology up just inside the doors. Vendors brought in their stuff and a few jugglers took to the floor or milled around meeting old friends. By the evening it was crowded and intense, with a lot of technical solo juggling and passing groups. The cool weather kept most folks indoors, and the matÈ pot saw heavy use. Emory Kimbrough of Tuscaloosa, Alabama, snapped still pictures for us. Juggling continued until 11pm. Saturday morning started early with more of the same. Rick Purtee managed several really fun and complex large-group passing patterns, including the Isla Vista Shuffle, a 5-person weave where the weavers actually move in a 5-ball pattern. Saturday afternoon games were ably chaired by Spencer Schwab. New Jersey’s Andrew Kaefer took the 3-ball Simon Says trophy. Lucian Fuller from Florida was the Blind Juggling winner, after the traditional Deception and Huddle when he became the last one standing. Andrew Kaefer also took home $10 or so in quarters and the trophy in the Quarter Juggling competition. Delaney Bayles of Utah won the 5-ball endurance after a tough competition finally decided by walking around the stage. Lucian also took home the Club Balance trophy. Our own Rachel Stern triumphed in the Club Crown competition — no walk through the gym required this time. Christian Kloc of Washington DC and Stephen Doutt of Pittsburgh took the 7-club trophy, which requires passing 7 clubs between two random jugglers the longest. Groundhog winner Chuck Clark took trophies in both Club and Ball Combat, reffed by Lao Alovus. About 650 people attended the Groundhog Day Competitions, kicked off for the 40th time by the famous Kelly’s Seed and Feed Marching Abominable Band. New groundhog trophies were designed and created by Asheville juggler Walter Beals, as our revered old trophy maker has retired from the business. At the Cabaret AJA president DrewBob Ford presented the Mouse Award to Walter for his work on the new trophies. Festival MC Rodger French presented the band’s Broom (leader) with a special Groundhog Trophy for their efforts over the years. 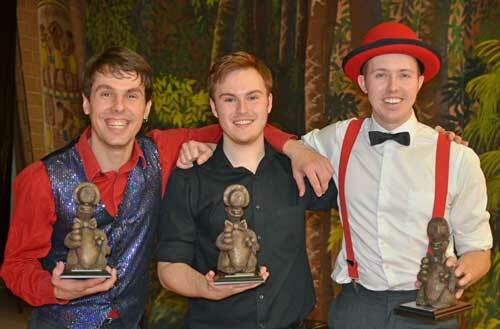 Eleven competitors vied for the Coveted Groundhog trophy this year. Winners were Cincinnati OH’s Brian Koenig (Awe Inspiring), Chuck Clark of Allen Park MI (Breath Taking), and Houston Odum of Greensboro NC (Mind Bending). Brian’s act featured some opening hat moves and ball spinning, followed by clubs and rings culminating in a 6-ring pulldown and a brief 5-club juggle. Chuck Clark’s act featured some sophisticated ball-balancing but no actual toss-juggling. Houston Odum’s act featured some of the fastest, lowest club tossing I’ve seen in awhile. Other notable moments included Ted Joblin (Nashville TN) with a wonderfully constructed diabolo act and Bill Berry (St Petersburg FL) with a gimmicky but amusing ball-spinning performance. Judges were Julia Carter, Dereck Bradley, and Christopher Oquan, ably wrangled by Meredith Gordon. Sound was run by Craig Lewis and Hal Baird. Amanda Miller ran the raffle. Brandon Ross recruited an army of children to ruthlessly pitch for cash from the crowd. The 9pm Cabaret featured the Deluxe Vaudeville Orchestra, performing again after a 10-year hiatus. 22 short acts rounded out the evening. Highlights included Delaney Bayles’s astounding work with clubs and rings, Steve Langley doing soap bubble manipulations, and Kenny “The Amazing” Toombs showing a smooth contact juggling routine. The AJA’s own DrewBob Ford also did some credible ring work, and Rick Purtee contributed some good diabolo manipulations. Sunday morning started strong and kept going. The last juggling of the festival was an enormous long thin feast which we just managed to pull together before last call. Nineteen people showed up for the Groundhog Dinner, choosing it over the Super Bowl also scheduled for that evening. A mysterious benefactor comped the entire meal, which broke up around 9:30 as everyone staggered off to catch up on sleep. My name is Bryce Taylor and I work for a summer camp in Northern California called Camp Augusta, and we are actively seeking talented performers, musicians, contortionists, and everything else to come join our team this summer, where they can teach their skills to children, and grow a little bit themselves, as well! Below is a little bit about us, and you can check out our website to see more. A dash of wish, a smattering of wonder and a sprinkle of surprise. An open heart, a curious mind and an inability to tell the difference between your skin color, your constant dirt tan and the paint and glitter permanently embedded on your body. A wacky playfulness, an inspirational spirit and a never-ending supply of empathy. Special wake-ups, unpredictable cabin activities, magical play stations, enchanting evening programs and awe-inspiring embers. 90 campers, 60 staff, 9 horses, 5 goats and 6 chickens. Multiple unicorns, a splattering of zombies and a friendly coven of vampires. The longest staff training in the country, 150 + clinics, flat hierarchy, nonviolent communication and success counseling. The combination of you and us; the ideal amalgamation to reclaim and foster the beauty, wonder, awe, potential, and innocence of childhood. Come be our next Gandolf, Dumbledore or Yoda. Come be part of the adventure – check out our website (www.campaugusta.com) and email us at applications@campaugusta.org or add your interest here: to start your journey. Or call 530-265-3702. Have a fantabulous day! Each page of each issue appears in full quality just like it did in the printed magazine, and the resulting PDFs can be quickly searched for included text (try that with your printed magazines :). The complete digitized Juggler’s World package is available to IJA members for $30 (non-member price: $40). To get the IJA member price, go to the IJA Vendor Discount Program, and if you’re not already logged in, click on SIGN IN at the very top. Once logged in, click on “CLAIM VDP DISCOUNTS” to get to the member page, where the Lybrary.com Juggler’s World offer is near the top. Make your purchase by following the directions under “HOW TO USE”. The DVDs for the 2017 IJA Festival in Cedar Rapids are available for purchase from the IJA Store. Containing about 4 hours of video from the fest on two DVDs, they’ll give you a sampling of pretty much everything that went on, even Water Skuggling (juggling while water skiing). The full routines of all the Stage Championships competitors are included. The 2017 IJA DVD 2-Pack is $30 for members, so if you see a $40 price, it means you’re not logged in. In that case, just click on SIGN IN at the top and then you should see the $30 price. The full 4 hours of official 2017 IJA Festival videos are being released free to members in the eJuggle members-only section in installments.